Welcome to the website for the 2016 National Response Team (NRT) Worker Safety and Health Technical Conference! The 2016 Conference Planning Committee is pleased to invite you and your organization to the FREE Conference, which will be held October 18-19, 2016 in Washington, D.C. This conference is being held in partnership with interagency members from the National Response Team. To register for the Technical Conference, please check the Registration Bulletin on the right navigation menu and complete the form. Virtual participation will also be available, but you must register to ensure you receive connectivity and call-in information. Conference Mission: The Technical Conference provides a forum to discuss current trends and topics, share information, and advance the work of the NRT Worker Safety and Health Subcommittee, which is to improve the safety and health for workers related to oil and hazardous material response and recovery. The conference fosters relationship building between the federal interagency, state, local, tribal and territorial agencies, and non-governmental organizations. Session topics will cover current issues, best practices, theoretical/practical applications, and/or other pertinent and pressing subjects related to oil and hazardous materials response and recovery. Main conference sessions listed below. *The agenda is available from the documents menu on the right side navigation. Safety officers, first responders, occupational health professionals, disaster planners, and other emergency management decision-makers, in local, state, federal, or tribal governments, as well as non-government organizations are welcome to attend. 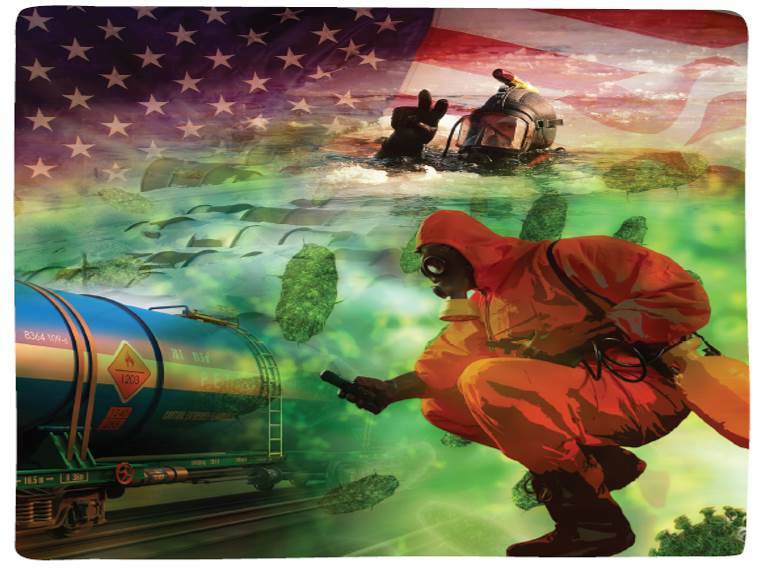 Overview: The US National Response Team (NRT) is an organization of 15 Federal departments and agencies responsible for coordinating emergency preparedness and response to oil and hazardous substance pollution incidents. Under the NRT Response Committee, the NRT Worker Safety and Health Subcommittee focuses on worker safety and health issues related to oil and hazardous material response and recovery. The Subcommittee is proud to sponsor this technical conference. Conference Facility: The Conference will be held at the U.S. Coast Guard Headquarters located at US Coast Guard Headquarters,St. Elizabeths Ave SE & Ash St SE Washington, DC 20032. All visitors are processed through the Gate 4 visitor’s center, located at the end of St. Elizabeths Road SE, which intersects with Firth Sterling Avenue SE. Participants must have a valid government issued photo identification to enter the campus and will be required to go through a metal detector. Non-government employees will need to be escorted in by a USCG employee. Public Transportation, Parking and Security: For information on arriving by metro, driving directions and parking, as well as security requirements, please visit the U.S. Coast Guard Visitor Instructions page. Certification Maintenance (CM) Points: CM points for both Certified Industrial Hygienists (CIHs) and Certified Safety Professionals (CSPs) will likely be awarded for participation in this Conference. Credit should be sought on an individual basis through The American Board of Industrial Hygienists (ABIH) at http://www.abih.org/maintain-certification/cm-by-worksheet. Agendas with summaries will be provided at the conference, so that you can receive credit. Contact: Please contact Catherine Foley (catherine.foley@csra.com) or Michael Lengle (michael.lengle@csra.com) with any questions or concerns. No media coverage of this event is permitted; no cameras or recording devices are permitted. Thank you.